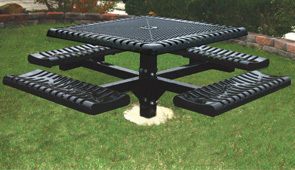 These uniquely designed 46" x 46" (3 Seat ADA - 46" x 57" 2 Seat ADA - 46" x 68") outdoor tables feature thermoplastic coated 3/4" # 9 ga. expanded steel tops with a 2" radius rolled ribbed steel edge. The attached seats are made of 11 ga. ribbed steel that is rolled to form a comfortable form fitting bench. The pedestal mount is made from 4" square galvanized steel tubing with a heavy-duty powder-coat finish. Both the tops and seats can be finished with a glossy Plastisol or lightly textured matte Polyethylene coating in any of the color options shown below.